I have a confession, I love wooden letter tiles. They are such a great teaching tool because they can be used as letter manipulatives and math practice. And my students would argue that they make great dominoes, but I try to steer them away from that. 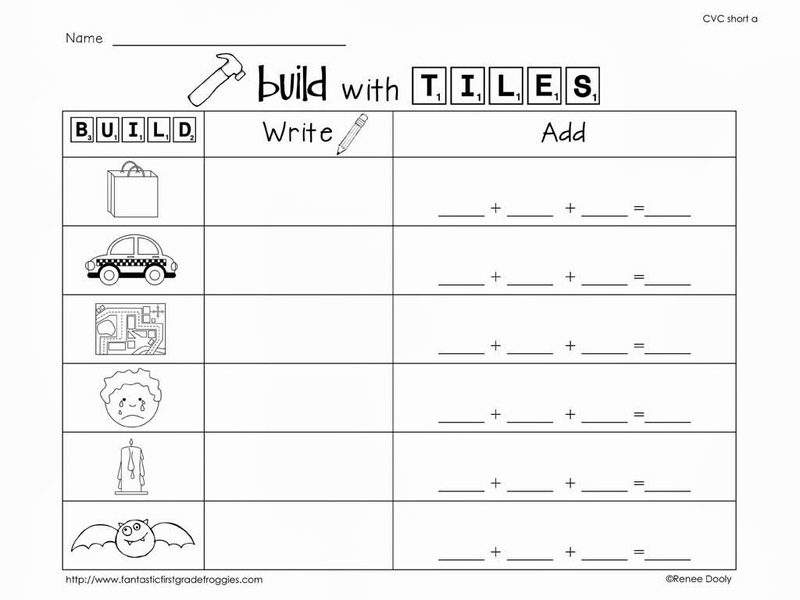 Last spring, I shared how I use the tiles with my sight words (see this post). Since we are practicing CVC words, I thought I would make a practice activity that would reinforce those words. Here is what my kiddoes are doing. First they spell the CVC words with their tiles using the picture cards. Next, they write the word on the recording sheet. Last, they add up the numbers on the wooden tiles to get their number answer. The kids love it! Now for a couple of my kids, this is too hard. For them, I pick the sound I want them to practice (beginning, medial, or ending) and I write in the rest of the letters using a dry erase pen. That way I can isolate the sound I want them to practice. Here is a better look at the practice sheet. I can challenge my kids who need the challenge with this as well. I have them write longer words on the back of their paper and they add them up. They think that is great! If you are interested in this Tile It! activity, click below. This looks fun! It is a great way to get kiddos who love math to love word work too! I'm off to find wooden tiles! I don't have enough of them in my Scrabble game.